There's a lot of great music currently coming out of Chicago. But there's also a lot of great music that came out of this city in past decades. Pezband is one example. To be exact, Pezband came out of Schaumburg and onto the power pop scene in 1977 with their eponymous first album on Passport Records, and not only did they have a great name (makes me think of the candy), they had a canon of strong songs to boot. The band holds a unique place in Chicago power pop in that they sounded rawer than Shoes, but less hard rock than Cheap Trick. Even so, any fan of either of those classic Chicago bands should find much to love about Pezband. The band's first album is by far my favorite of their three LPs, and I would rank it very highly in my list of essential albums for any fan of power pop. The album opens with Baby it's Cold Outside (no, not the cheesy pop standard), a must-include song for any power pop mix CD. The album never really loses steam, jumping from classic to classic with tunes such as Tracer, Princess Mary, Gas Grill and Please Be Somewhere Tonight. There is an irresistible 60s-inspired innocence to these hook-filled songs, but they are also marked by a sheer enthusiasm that gives the collection an edge. In addition to the songs themselves, the distinctive vocals of lead singer Mimi Betinis add to Pezband's charm. Pezband went on to release two other albums - Laughing in the Dark in 1978 and Cover to Cover in 1979. While both of these are very enjoyable releases, for me they don't quite reach the level of greatness set by the first album. Laughing in the Dark is a burst of rock and roll energy from start to finish (there's really not one mellow song in the bunch) and a bit rougher around the edges, bringing in some pub rock sounds to the classic power pop formula. The album spawned one hands down classic in Stop! Wait a Minute, which is generally considered Pezband's second signature song after Baby it's Cold Outside, and an additional single in On and On. While the raw energy of this album can't be denied, I personally find the hooks to be a bit stronger on Pezband. 1979's Cover to Cover is another worthwhile release and an enjoyable listen all the way through, although the album lacks a surefire classic in the vein of Baby it's Cold Outside or Stop! Wait a Minute. 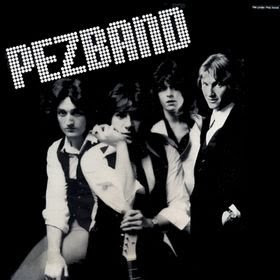 Unfortunately, despite three fantastic albums, Pezband never quite gathered enough steam to gain them widespread recognition, and the band ended its first run in 1980. Despite an unsuccessful attempt to restart Pezband in late 1981, little was heard from the members until 2006 when the band reformed and began playing new, well-received shows, much to the delight of both old and new fans. With any luck, we'll even be treated to some new Pezband recorded material. All three Pezband albums have been released on CD, but unfortunately only as pricey Japanese imports. However, the inflated price of these discs is well worth it considering the high quality of the music, and they can be purchased through Not Lame Records (link) or other outlets such as Amazon.com. The guys in the original PEZBAND were from Oak Park.